And the no. 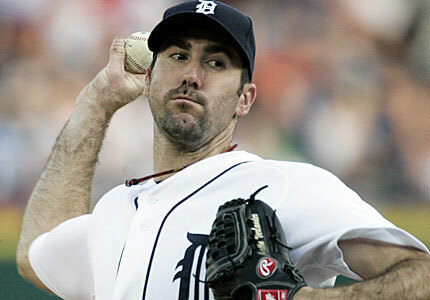 2 pick is…Justin Verlander? POINT McGILLIGAN: Before my draft, I was sure I could trace the demise of my 2012 Fantasy Baseball team to early May, 2011. It was around this time my daughter was conceived and, little did I realize, my sporting intake would suffer dramatically. Heading into this year’s draft, I really only knew the big offseason transactions (Pujols, Fielder) and not much else. I knew my Red Sox were still trying to live down the chicken and beer thing (Note: one guy in our league used that as a team name, I believe it will be the most used team name in fantasy sports this year) and had hired Bobby Valentine. No in depth studying for sleeper players, rookies to watch for, or my personal favourite of analyzing second half statistics so I too could convince myself not to take Jose Bautista. Basically, he seemed to have done all the homework necessary for a successful draft while I was nervous enough that I wanted to start smoking again. Without preparation, I was convinced I would hover near the basement of the league. Then came the second pick of the draft. With matt Kemp selected first the next pick was……Justin Verlander? I like the Tiger hurler as much as the next guy, but in more of a late second, early third-round kind of way. The fact that the pick came from Livingstone was even more perplexing, until I saw the little symbol above the team name that indicates auto draft is on. If you’re in a fantasy league and auto drafting, you’re missing like 70 per cent of the fun. If you’re the commissioner of the league, as Andrew was, it’s almost inexplicable. Anyway, after that I began to feel a bit better as Andrew’s team is in shambles (he claims it’s alright but he’s pressing for deals already) and I’m a bad enough person that this has a positive impact on me. As for my team, my two-month old daughter is off the hook as I currently like my squad (keep in mind no games have been played). The strength of my team is the infield, outfield is decent but could be great if Carl Crawford can rebound (picked him up in the ninth round) and the pitching is solid with the big names being Weaver, Kennedy and Kimbrel. The biggest gambles on my squad are Justin Morneau and Phil Hughes, both late round selections that could prove to be huge or utter wastes of time. So to recap, I’m feeling good about the season and since my Habs are nowhere near the playoffs (not that I would be in any shape to watch given my constant zombie like state), I’m ready for the games to start counting. I’m also curious how Livingstone will remake his team. COUNTERPOINT LIVINGSTONE: I dove across the floor of my cramped apartment. Frantically, I ripped my computer from my bag and tossed it onto the bed. How the hell did I mess up my fantasy draft start time? I’m the damn commissioner. I set the time. It’s every fantasy baseball nuts’ worst nightmare – and it’s ten times worse being the head of the league. I jumped in on the 16th round, I think, I was more frantic at the fact my pick was up and I had just over a minute to make a selection. I had no idea what I had. And after reviewing my half-team quickly I found a lights out pitching staff and what looked liked a roll-of-the-dice batting order. My team was full of potential breakout guys like Dee Gordon and Jeff Kipnis (shudder, who I drafted fourth round, or 39th overall), a potential comeback player of the year (Giants catcher Buster Posey) and a potential Giancarlo Stanton (Nationals’ Michael Morse). Oh, and Ian Desmond, who went 62nd behind Ichiro. I groaned. I drafted ten pitchers in my first 15 picks. Having no plans to miss the draft – I spent weeks preparing my rankings in a particular way so not to forget about sleeper guys and potential late-rounders (see Kipnis) – I scrambled to see what was left to me. Sadly, I was left to piece together a bunch of bats that hopefully would have breakout years. Cardinals’ David Freese, Angels’ Mark Trumbo, Jays’ Colby Rasmus, Orioles’ Nick Markakis, Padres’ Carlos Quentin, welcome to the rag-tag team known as Team Beast. It’s a gamble. My team has the potential to put up consistent numbers across the six batting categories – but it’s a gamble. Most of these guys are unproven but said to be on the up and up, had breakout years last season, or have the potential to rebound from off-seasons (Quentin and Rasmus, I’m talking about you). I’m either going to be laughing all the way to the top of the league, or damn near close, or I’m going to spend my season trying to stop the bleeding with hot free agent pick-ups. Either way, I’m in for a treat. I’ve got speed, guys who hit for average, solid run production and run producers – but only if the stars align. Gamble, like I said. I’ve already made changes to my squad, having to adjust my strategy now that, well, it went completely out the window. Drop Raul Ibanez, sign Gaby Sanchez; drop Luke Hocevar, sign Greg Holland (had too many starters and needed another relief/closer to round things out); drop Mitch Moreland, pick up Lucas Duda; send Angel Pagan back to heaven and recruit Delmon Young. Now – The Verlander deal. Yeah, I drafted him second overall. He killed it last year and was one of the biggest fantasy point getters overall. Reviewing our draft, it’s a lot of guys picking bats over pitching. I’ve always been one to draft pitching early on – I think a strong staff and an above average bunch of bats can end up doing well. That said, my bats aren’t where I’d want them to be and I’m sweating about it, in fact, I lost sleep over it last night. But then I look at someone who drafted the entire time and they took flash-in-the-pants guys like D’Backs Ian Kennedy, a walk-machine (Nats’ Gio Gonzalez), the $100-million bust (Sox Carl Crawford) and Justin ‘I play baseball?’ Morneau. Oh, and old man David Ortiz. That all said – I take the insults as a grain of salt and plan, with some strategic maneuvering all-season, to be at least three spots ahead of McGilligan and his Team Charros. I missed the first part of the draft – he had a baby. Neither are fair excuses for what mediocrity may ensue from our teams.